We are very attentive towards the breeding of our flock as this is the first step to consistent quality produce. Be it day-old-chicks, pullets, layers and spent hens, years of experience garnered in this field have taught us that there is absolutely no compromising when it comes to qualitative breeding. Our imported automated closed-house system comprising computer controlled ventilation and cooling system complete with automated feeding and egg collection facilitation provides a hygienic and comfortable breeding environment for our birds to flourish in. To maintain High Performance breeding standards, we partner credible expertise in the league of Merial – a world leader in the provision of animal health products and services. Implementing international standards for quality and safety, we ensure that our poultry are regularly cared for adhering to animal- welfare requirements and raised with a combination of quality, nutritious and adequately balanced feed. Feed contributes to the flock’s uniformity in producing the desired healthy egg color and egg shells solidity. With the right feed, correct energy level, sufficient calcium and protein, we not only get good quality eggs but have the capacity to maintain this good quality always. How do we ensure a Superior Quality Feed System? Nutrition Quality Supervision – For optimum performance, it is important to follow the feed and nutrition specifications from the breeding company. As such, our Feed is sent to a laboratory every three months to check on its nutrition content. Feed Formulation – Our feed formulation is enriched with calcium by the 17th week of conception so the eggs produced have less breakage. Feed Conversion Rate – We use parameters such as feed conversion rate to help gauge if feeds are on the right track so that we can monitor early or late egg-laying which can affect an entire flock’s performance. In-house Feed Mill – We invest in an in-house mill system that adjusts and predetermines formulas according to the quality of raw material that the chicken is provided. Whilst following general guidelines of breeding, we enhance our poultry care by customizing specifically for our wide-ranging flocks. 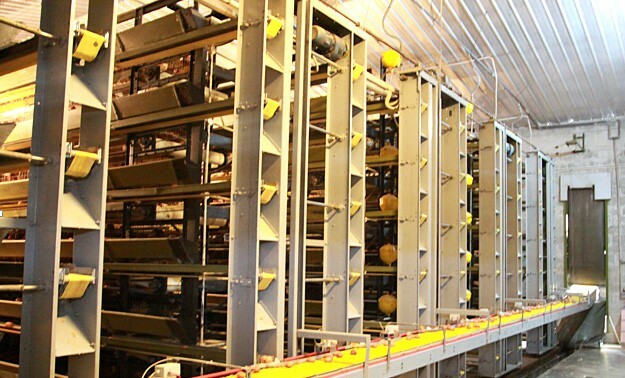 In-house engineering manages eggs produce without the necessity of personnel handling – eggs are moved out of the houses on automatic conveyor belts, sanitized, graded and sorted using the latest fully automated high capacity egg-grading machines.